How Much Can You Make in a Health Education Career? What Courses Can be Taken for an Online Health Education Degree? Health educators work with individuals, families, and communities to address health problems and promote healthy lifestyles. They often collaborate with public health agencies and other medical professionals to perform research and implement action plans that result in longer, healthier, and happier lives for their clients. The Bureau of Labor Statistics (BLS) projects 16% growth for health educators and community health workers from 2016-2026. If this projection remains accurate, recent health education graduates should have little trouble finding fulfilling careers over the next few years. To enter the field, you must first earn a bachelor’s in health education. In this program, you study not only the science of health, but also the psychological and sociological factors that can lead people to make better health decisions. Earning your health education degree online has many benefits, especially if you already work or have a family. In this article, discover more about learning online, searching for programs, paying for school, and establishing a career. Mississippi University for Women offers a Bachelor of Science in Public Health Education that can be completed online. The courses for this program include Infectious Diseases in Public Health, Biostatistics for Public Health and Public Health Interventions. A required capstone course involves an internship that gives students the opportunity to gain field experience at an approved agency. To graduate, students must complete a minimum of 124 credit hours. After graduation, students may work in fields such as community health, school health, government health and worksite health. 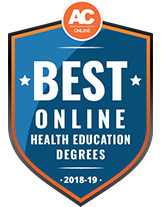 An online Bachelor of Science in Public Health with a concentration in Community Health Education is available at The University of Carolina at Greensboro. Students who are interested in this degree must have a GPA of 2.5 or higher, complete 6 public health related courses and earn a grade of C or higher in any health education course they take. This program is designed to help students develop the skills they need to plan and implement community strategies that promote healthy lives and help prevent various health problems. Upon completion of this degree, students may sit for the Certified Health Education Specialist exam and work in higher education, government, health care or for nonprofit organizations. As of the writing of this article, the salary for health educators and community health workers averages $45,360 per year. As is the case with most professions, recent graduates can expect to earn less, while those in managerial positions typically earn more. No degree or job title guarantees a specific salary. As you gain relevant experience, related positions open up to you. The five careers in the table below represent entry-level positions and related careers that experienced health educators can perform successfully. Some positions may require both relevant professional experience and an advanced degree. Health specialties teachers instruct students at the undergraduate and graduate levels. In addition to teaching health-related courses, they mentor students, grade papers, and prepare curricula. Teachers at this level possess either a master’s or doctorate. Also, many teachers have extensive experience working in public health; this real-world experience helps teachers better convey essential concepts to students. Dietitians and nutritionists work with clients to identify their health and nutritional obstacles and propose solutions. Much of their work involves interviewing clients to understand their eating habits; they then develop dietary plans for their clients. Some dietitians and nutritionists further specialize through becoming experts in topics such as diabetes health. Also known as high school teachers, secondary school teachers teach students in grades 9-12. Their job duties closely resemble those performed by postsecondary teachers. At the high school level, however, secondary school teachers use their bachelor’s degrees in health education to instill their students with healthy habits. They often teach biology, physical education, or a related subject where they can apply their expertise. Social and human service assistants work alongside social workers to connect clients with social services such as food assistance or medical care. Professionals who possess a bachelor’s in health education identify how lifestyle changes can play a role in clients’ treatment plans. Also, this background knowledge helps social and human service assistants identify issues that others, even trained social workers, might miss when evaluating clients’ needs. People in need turn to these counselors to address underlying mental health or behavioral disorders affecting their lives negatively. These counselors interview clients before developing a treatment plan that may involve medical intervention or other social services. A bachelor’s in health education prepares graduates to work with clients who suffer from eating disorders such as obesity or anorexia. Each state necessitates different types of health education. The financial and physical resources each state sets aside for health education vary as well. As a result, no two states offer the same average salary or number of open positions. As of the writing of this article, Alaska, the District of Columbia, and Vermont boast the highest concentrations of health educators in the U.S. The District of Columbia also ranks highest concerning average salary; Maryland and Georgia follow close behind. When researching where to work after graduation, do not forget about rural areas; rural areas often have limited access to hospitals and other medical services. Working there, health educators can make a tremendous impact. As you research online bachelor’s degree in health education programs, you might realize that many programs’ lower-division courses resemble one another while higher-division courses vary. Health education rests on the foundational knowledge that all students must learn before they branch off to elective courses related to their concentrations or minors. In the table below, learn more about lower- and higher-division bachelor’s in health education courses. Do not forget that the best way to learn more about a course involves contacting a college or university’s health education department directly. This course introduces students to the health education field. Here, students gain exposure to different concentrations and topics they can explore in later courses. Many programs require students take this course during their first semester. All health education students must understand the body’s basic structures and functions. Students study all major body systems and how diseases and negative lifestyle choices affect systems’ function. This course appeals to students who plan to work as health education administrators. Coursework emphasizes administration techniques such as managing personnel and creating budgets. Depending on the program, this course may qualify students to earn a certified health education specialist credential. Students concentrating in health promotion take this advanced course near the end of their degree programs. Course topics include how research into health education affects the field as a whole. Coursework also conveys crucial research skills students need if they plan to earn an advanced public health degree. In this course, students concentrating in healthcare administration learn how social services assist the elderly and people with mental health and physical disabilities. Students analyze practical examples to understand how healthcare providers increase healthcare quality and access for these groups. At this stage, you might have dozens of questions about how to choose the best online health education program. Instead of feeling overwhelmed, start with a single question: What do you want to achieve in your career as a health educator? Through developing an answer, focus on other questions, like those below, that help you choose the program that best fits your interests and professional goals. As you read the following Q&A, consider jotting down other questions that come to mind, those you can answer through research. Is there a specific concentration that is in high demand right now? The answer depends on two factors: where you plan to work after graduation and how the health education field changes over the next few years. For example, if you plan to work in a rural area where people struggle with obesity, a concentration in nutrition and dietetics makes you a more competitive job applicant. However, if you plan to live in an urban area or hope to work at a hospital, you may consider concentrating in medical imaging or medical technology. Over the next few years, as more of the U.S. population enters retirement, health services providers should need more health educators who specialize in gerontology or occupational health. How do I know if a program is out of my price range? In the time between now and when you start school, you may earn thousands of dollars in scholarships and grants, reducing your tuition bill significantly. At this point, you may need to take out loans to finance the remainder. When the time comes, you can quickly and easily determine which programs are out of your price range. If you calculate that paying back a loan in full should take more than five years after the time you graduate, then that loan is too much. Simply put, paying back loans for more than a few years can result in a significant hindrance on your personal and professional plans. Should I choose a cohort or individually paced program? If you want to earn your degree as fast as possible through taking extra courses each term, choose an individual-pace program. 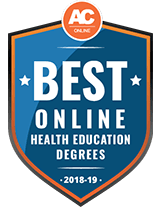 Individual-pace programs give you the greatest flexibility when it comes to your online health education bachelor’s degree. Cohort programs require you to take courses in a set order, with the same group of peers. Cohort programs’ biggest advantage involves networking. Through working alongside the same people for four years, you have the chance to form deep professional bonds that can last throughout your career. How important is a school’s reputation? While a factor in hiring, school reputation should probably represent your final consideration when selecting programs. Qualities such as professors, courses, and concentration may take precedence over reputation. Also, if a school excels in these areas, it should, by default, have a good reputation. Also, as more students earn their degree online, employers have a better opinion of online schools than they did in the past. I live in a rural area. Will I be able to complete my program’s required internships, practica, or other in-person components? The answer depends on the health services in your local community and the contacts your program has with local healthcare providers. Reputable health education degree online programs reach out to hospitals and social service agencies in your area to arrange placements. If you think your area lacks these opportunities, contact programs on your shortlist to explain your situation. They may know of placements you never considered. As you make these inquiries, research potential programs that do not have in-person requirements as well. When researching online health education degrees, tuition, fees, and related costs such as textbooks can make you feel as though you cannot afford a quality education. However, loans, grants, and scholarships exist to help you pay for a degree. Many banks may offer you loans, but paying them back can take years, sometimes decades. Also, you may not qualify for grants; grants typically require that applicants prove financial need. That leaves scholarships, which consider the same criteria as do college admission counselors: academic merit, test scores, and recommendation letters. Also, like grants, you do not have to pay back scholarships if you use them appropriately. In this section, learn more about five scholarships relevant to bachelor’s degree in health education students. SHAPE America presents this $1,000 scholarship to one undergraduate student majoring in health education. Applicants must hold sophomore, junior, or senior status at their schools and possess a minimum 3.25 undergraduate GPA. To apply, submit a resume, 450-word essay, transcripts, and two recommendation letters. Scholarship recipients also receive a one-year SHAPE America membership. The scholarship does not renew, and scholarship recipients cannot apply for the scholarship a second time. The Christie Foundation awards over $125,000 each year to undergraduate students studying health education or a related major. High school seniors planning to major in health education may apply alongside currently enrolled college students. To apply, submit academic transcripts, three recommendation letters, and the application form. The application deadline typically falls at the end of March, with the scholarship committee announcing its decisions one month later. The NIH awards up to $20,000 to students studying a health-related field who plan to become health researchers. The scholarship also provides funding to participate in research training at NIH headquarters and possible employment after graduation. Applicants must possess a minimum 3.3 undergraduate GPA. The application period opens in early January and closes in March. The NIH makes award decisions during the summer. Each year, the Society for Public Health Education (SOPHE) awards $2,500 to three undergraduate or graduate public health students. Undergraduate students must have already earned 40 or more college credits. To apply, join SOPHE before submitting transcripts, a two-page essay, one letter of recommendation, and a resume by September 30. Scholarship recipients also attend the annual SOHPE conference; SOHPE pays for all travel expenses up to $800. Unlike many other health education degree online scholarships, the scholarship committee considers financial need as well as academic merit. Open to California residents, the Winifred Van Hagen/Rosalind Cassidy Scholarship awards $1,000 to one undergraduate student studying health or physical education. Applicants must have already completed at least 60 credit hours and possess a minimum 3.0 undergraduate GPA. To apply, submit transcripts and three recommendation letters by the November 30 deadline. The scholarship committee makes its decision the following January and presents scholarship awards one month later.